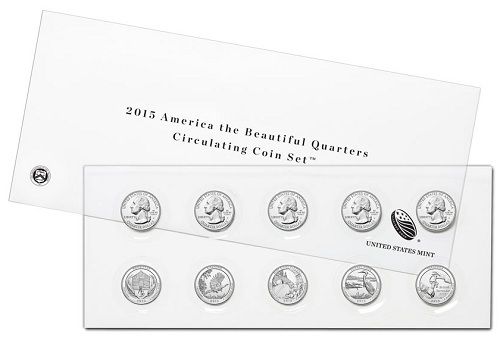 The U.S. Mint is now taking orders for the 2015 America the Beautiful Quarters Circulating Coin Set. The set includes 10 quarters in all, including examples of each of the five 2015 ATB issues produced at both the Denver and Philadelphia Mints. Each set costs $5.95; there are no stated production limits for this item. The five quarters respectively feature the following sites honored as part of this year’s America the Beautiful program: Homestead National Monument in Nebraska, Kisatchie National Forest in Louisiana, the Blue Ridge Parkway in North Carolina, Bombay Hook National Wildlife Refuge in Delaware, and Saratoga National Historical Park in New York. All of the coins in this series share John Flanagan’s portrait of George Washington as an obverse image. This set is an affordable way for collectors to obtain examples of all of this year’s America the Beautiful circulation issues. Its release comes on the heels of yesterday’s Saratoga National Historical Park quarter launch ceremony, which saw the final America the Beautiful design of 2015 released into circulation. The 2016 series of ATB quarters will kick off with the release of the Shawnee National Forest quarter on Thursday, February 4, at Southeastern Illinois College in Harrisburg, Illinois. 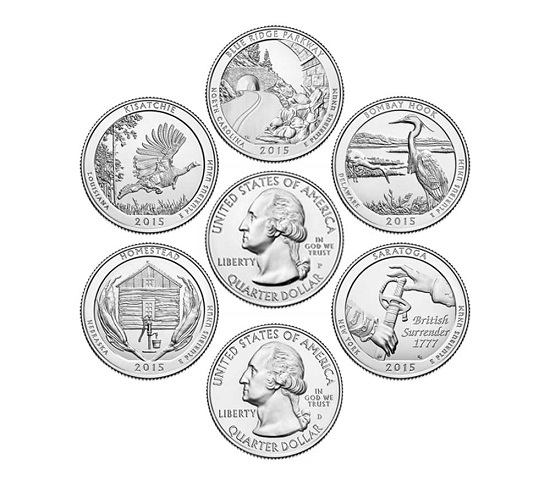 For more information on the U.S. Mint’s America the Beautiful quarters program, please visit the U.S. Mint’s Web site.